NEWELL, S.D. — As an illustration of the lengths the federal government must now go to manage all the wild horses under its care, it doesn’t get much more telling than this: In South Dakota, a Powerball jackpot winner is now getting paid to let the government’s horses roam his land. Wanless, who is preternaturally averse to media attention, did not attend the tour that was staged for the media Tuesday. His ranch manager, Adam Karrels, attended in his stead. “He likes his privacy,” Karrels said. Wanless’ privacy is further protected by his private arrangement with Spur Livestock LLC, which has a registered address in Midland and is owned by South Dakota ranchers Jim Reeves and Lyle Anderson. The government pays Spur Livestock a varying rate of around $2 per head, per day, to ensure that the horses are fed, watered and kept relatively wild and free-roaming. Spur Livestock, in turn, has a private deal with Wanless to keep the horses on his land. Spur Livestock has another contract for 400 BLM wild horses kept on land near Eagle Butte. During the past fiscal year, the company was paid a total of about $1 million by the federal government, according to the government website USAspending.gov. The pastures managed by Spur Livestock are known as “off-range pastures,” because they are home to excess horses culled from the free-roaming herds on vast BLM ranges in places such as Nevada, Wyoming and Oregon. The BLM has about 67,000 horses on wild ranges, which BLM officials say is 40,000 more than the ranges can support. Some of the excess horses are adopted, but those that are not adopted must be kept somewhere. Increasingly, those horses are being sent to off-range pastures. There are now 32,000 wild horses in 28 off-range pastures like the two operated by Spur Livestock, and the BLM is adding five more off-range pastures this year. Another 12,000 excess BLM horses are waiting in holding corrals, bringing the total number of off-range horses under the BLM’s care to nearly 45,000. During the 2015 fiscal year, the federal government paid the owners and operators of all those off-range corrals and pastures $49 million. The BLM has little choice but to keep all of its horses alive and well, because of the Wild Free-Roaming Horses and Burros Act approved by Congress in 1971. The law grew out of concern about the widespread roundup and slaughter of wild horses in the American West. It now prevents the killing of wild horses on BLM land and some other federal lands in all but a few limited circumstances, such as when horses need to be euthanized because of their old age, lameness or sickness. Some wild horses on non-BLM federal lands are not protected by the 1971 law, and when those horses grow to unsustainable numbers, they’re often adopted or rescued by private sanctuaries. That’s how the International Society for the Protection of Mustangs and Burros near Lantry accumulated many of its 810 horses, which were impounded recently by county authorities after allegations surfaced of starving horses on the society’s ranch. BLM officials on Tuesday’s tour stressed that there is no connection whatsoever between the private Lantry sanctuary and the BLM wild-horse program. The BLM is trying to stem the growth of its wild herds with ongoing research into population-control methods, including a fertility control vaccine. Meanwhile, the agency has few options but to keep culling wild horses from the ranges and expanding the off-range pasture program. In September, when a BLM advisory board voted to recommend selling or euthanizing some of the off-range horses, it sparked a public outcry and led the BLM to issue assurances that it would not act on the recommendation. There are still some cattle on the Wanless ranch near Newell, but 33,000 of the ranch’s 42,000 acres are now available to the wild horses. They will be moved around to various parts of the ranch throughout the year to avoid overgrazing, and they’ll drink from dams and from a system of pipes and tanks that Wanless installed to bring water from the Belle Fourche River. Other than that, the horses will basically live free until death. The average age of the horses on the Wanless land is 15 to 17 years, and some are as old as 34. As older horses die, more horses will be brought in, up to a maximum of 1,022 horses at any given time. All of the horses are geldings, having been castrated upon their removal from the wild ranges. Some other off-range pastures contain only mares, and none have studs. Not everyone has welcomed the horses. A neighboring landowner to the Wanless ranch, Sharon Herron, has appealed the BLM environmental assessment that allowed the herd to be transferred. 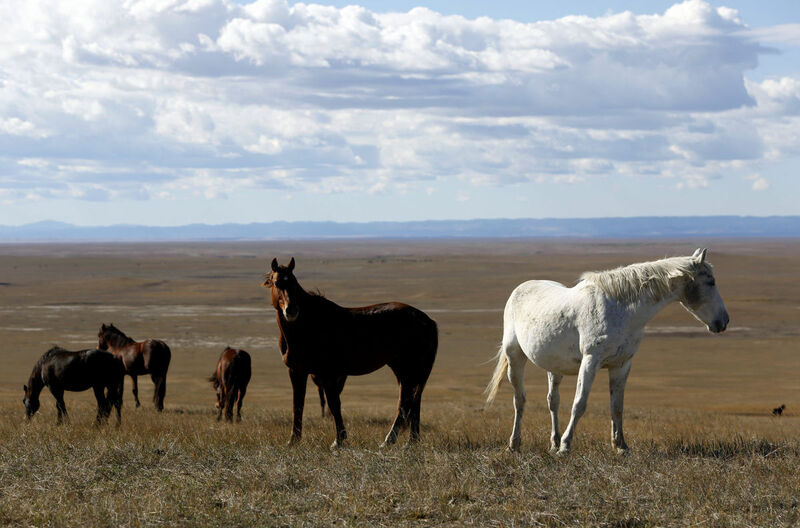 That appeal will be heard by the federal government’s Interior Board of Land Appeals and could result in anything from a rejection to an order to remove the horses. The BLM has tried to address one of Herron’s concerns by installing double-fencing along her border with the Wanless ranch, thereby providing extra insurance against wild horses roaming onto Herron’s land. But she has expressed numerous other concerns, including the cost of the wild-horse program to taxpayers. She thinks policies should change to allow some wild horses to be sent to slaughter. “The underlying problem is that the USA does not have a slaughter plant to properly dispose of live horses and to market horse byproducts,” Herron has written. One affected party that seems greatly pleased with the move to the Wanless ranch is the horses themselves. As reporters looked on Thursday, the animals spread across Wanless’ sweeping, scenic grassy and treeless plains, some of them becoming barely visible specks after crossing only a fraction of their new home. About 40 miles to the southwest loomed the unmistakable form of Bear Butte, and behind it stretched nearly the entirety of the Black Hills, with mountaintops such as Crow Peak, Terry Peak and Black Elk Peak clearly visible. Debbie Collins, an Oklahoma-based national marketing and outreach specialist for the BLM’s Wild Horse and Burro Program, marveled at the landscape.